You have finally found a new and convenient way to control your lights from anywhere. 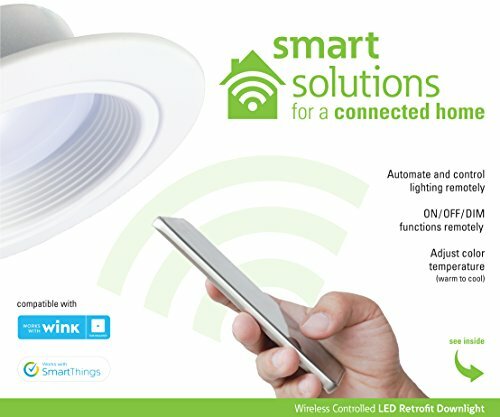 The Halo RL56 Zigbee Smart LED Downlight is a wireless, app-controlled light fixture that replaces a 65W incandescent light bulb and trim. Emitting 685 lumens (light output) and only using 9.5 watts of electricity, use of the RL56 Zigbee will save you up to $350 in Energy Savings over the life of the fixture. It's so great, Energy Star has certified it. Not an electrician No worries, with this easy to install LED Retrofit Downlight, you can connect this light into your recessed housing (can) with no problem and you won't have to replace it for over 50,000 hours (or 22 years). This downlight comes with an Edison-base connector (screw-in base), to retrofit your existing housing. Also, this downlight comes with both torsion spring and friction blade (clip) attachment methods, so you can insert this light fixture in whichever way you'd prefer. Want to create a warmer feeling in your room No problem, change the color temperature directly from your app, ranging from 2700K – 5000K (warm white to cool blue). Optimal for ceilings between 8'-10', this very wide flood light can also be used in wet or damp locations (i.e. above your bathtub, shower areas, or covered outdoor patio). From entertaining friends for an evening cocktail party to hosting an afternoon brunch, simply use your app to adjust the dim level of your lights (all the way down to 5%).